Windows 10 Cumulative Update 10586.71 (KB3124262) is Out! Windows 10 cumulative update 10586.71 is now available for Windows 10 PCs and tablets. 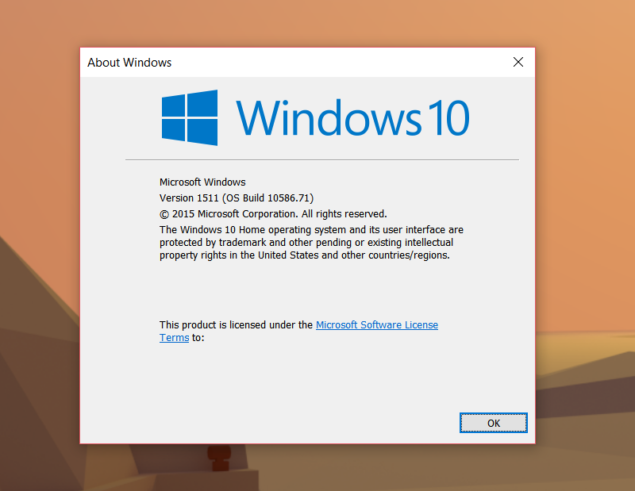 The update brings the usual bug fixes and security patches, as part of the company’s monthly routine to keep the latest Windows operating system updated, secure and stable. We were expecting this update to arrive yesterday, however, we later received reports that Microsoft was already working on a second update (build 10586.75) to roll out immediately after this planned Patch Tuesday update. As none of these came yesterday, we are still waiting to see if there indeed is a second cumulative update or if Microsoft managed to fix the issue it was planning to patch up with a second release. Microsoft continues to work on its latest Windows as a Service (WaaS) paradigm, sending out regular over-the-air updates to fix any reported issues in the operating system. The update will be downloaded automatically on your Windows 10 devices. However, you can also check it manually from Settings > Update & Security > Check for Updates. The update will be listed as Windows 10 Version 1511 (KB3124262). Keeping to its usual antics, Microsoft hasn’t shared any details in its official blog about what this update is actually trying to fix. But, since that debate is already over, users are recommended to install these updates as they often carry patches for critical security vulnerabilities. If you don’t see the update, don’t worry as the complete rollout may take a few hours.